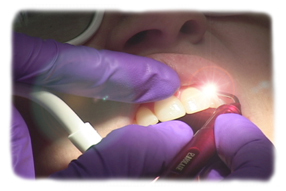 The Sterilase Laser Assisted Dental Cleaning is a great alternative to the traditional dental cleaning. Traditional cleanings cut and scrape around the immune membranes of the teeth, and subject the mouth and body to the millions of infectious microbes that exist around the teeth. The Sterilase Procedure cleans and disinfects teeth without infecting the surrounding oral tissue or the body, and is a much kinder, gentler procedure. In addition to the laser, an ultrasonic scaler is used, in which ultra-high-frequency sound waves are used to vibrate scale and plaque off of the teeth. A high-pressure water spray with sea-salt is also used to rinse off the teeth and gum area after the cleaning, leaving the teeth disinfected, free of plaque and scale build-up, and feeling clean and fresh--all without exposing the oral area and the body to infectious agents. The Sterilase Procedure is often recommended for patients who are going to have surgery, because ridding the mouth of infectious agents and toxins reduces the risk of post-surgical infections.